Little Tahoe is not a holiday house but a home! 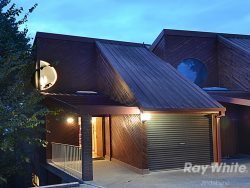 One of the best holiday rental homes in Jindabyne. Little Tahoe sits above beautiful Lake Jindabyne, the water so close you can almost touch it. Your view takes you over the water and north west to the Snowy Mountains. At night in winter, the car lights coming down from Perisher form a "snake" as they wind down the mountain. Inside Little Tahoe, a gourmet kitchen, outfitted with high-end appliances including built-in refrigerator and cook top, offers the ability to prepare restaurant quality food for your guests. Stop by the Jindabyne Butchery and pick up some country style meat cuts for your stay. For indoor dining, the formal dining area is situated in the open space between the kitchen and lounge area, where a comfortable leather sectional sofa invites you to enjoy a movie after a day in the mountains or watch your favorite game on the large, flat screen television. Plug in and enjoy the Free Wifi at Little Tahoe. Three comfortable bedrooms, the huge master with king size bed provide the perfect accommodations for large families or friends traveling together. The bedrooms share an oversized family bathroom with luxurious corner soaking bath and separate shower. All bedrooms have exquisite linen and amenities provided. Little Tahoe is located in the quiet of Tyrolean Village. This prestige architect designed home offers a true luxury experience. Decorated to a very high standard this unique home offers much more than your standard holiday home with many personal touches to welcome you. Peter was a great host and contact was alway easy, even with our late arrival.Joan was so helpful and kept in constant communication. He answered questions promptly and efficiently. We had a great time and would like to make it an annual event - we will be back! Such a great house for a group trip. We had 3 couples staying at the house for a ski weekend, and it was so lovely to come home to a warm house at the end of a long day on the slopes. The lounge/dining area is great and we were able to sit around and drink tea/wine while chatting and playing cards. Don't be put off by the cost - it is a 'snow village' after all and it was worth it to have such a great place to prepare meals and warm up. Great views of the lake and we even had a visit from one of the local furry neighbours - Harry the black lab. We will definitely use Little Tahoe again. Pete was very responsive to a couple of issues we had and resolved them quickly. really enjoyed the time there. Would have been perfect if the bath had the spa jets installed. Thank you we had a great time at the snow. Great view of Lake Jindabyne and mountains. Lovely home.